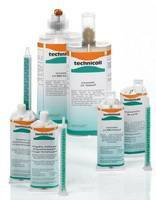 ... the large range of technicoll® 2-component adhesive for structural bondings? These adhesive are based on epoxy resin, MMA or PUR. They are available in different packaging sizes.